As the giraffes become more relaxed in our presence, they feed more closely and don’t look up at us quite as often. 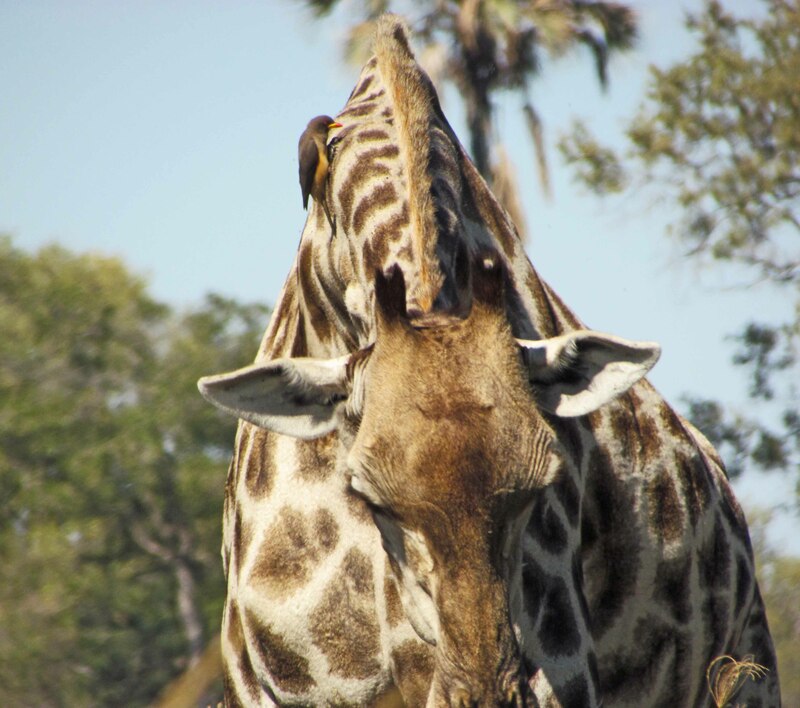 I stop and take a photograph, of a graceful giraffe with an oxpecker on her neck, as she bends down to browse. Red-billed oxpeckers use their bills to comb through the fur of large mammals both wild and domestic for ticks and bloodsucking flies, clinging to their hosts with sharp claws. They also feed on earwax and dandruff, and have been observed opening small wounds, as well as enhancing existing wounds, in order to feed on blood. Oxpecker courtship and copulation occurs on their hosts while they ride along, and they cushion their nests with hair from their host. Living together in the animal kingdom. Oh Ellen, this is too good not to share! May I do a “guest post” using your exact tale? I would post on Sunday as a response to Symbiosis. I’ve got 3000 followers all over the world and I’ll bet your story gets a ton of replies! Thanks for sharing this tale with me – I’ve never heard of such a thing!